Bibliometric data on psychology publications from 1977 through 2008 are modeled and forecasted for the 10 years following 2008. Data refer to the raw frequencies of the PsycINFO (94% English-language, mainly Anglo-American publications) and the English-language documents of PSYNDEX (publications from the German-speaking countries). The series were modelled by way of exponential smoothing. In contrast to Single Moving Average methods which do not weigh observations, exponential smoothing assigns differential weights to observations. Weights reflect the distance from the most recent data point. Results suggest strongly expanding publication activities which can be represented by exponential functions. In addition, forecasted publication activities, estimated based on psychology publication frequencies in the past, show positive bibliometric trends in the Anglo-American research community. These trends go in parallel the bibliometric trends for the English-language publications of German-speaking authors. However, while positive trends were forecasted for all psychological subdisciplines of the Anglo-American publication database PsycINFO, negative bibliometric trends were estimated for English-language publications from German-speaking authors in 6 out of 20 subdisciplines. Kliegl, R., & Bates, D. (2010). International collaboration in psychology on the rise. 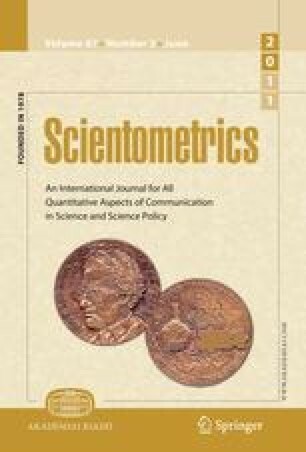 Scientometrics. doi: 10.1007/s11192-010-0299-0.